At first glance, Mirzapur, with its congested road, crammed, noisy traffic and unnecessary hullabaloo will make you feel a little apprehensive and suspicious about the people and place. But as you take a deep breath and take a step forward with your little getaway plan in this humble city, you will soon realise the hidden treasures Mirzapur has in store for you. It is however, not the city, but its outskirts that are its major attraction. Unpolluted green lush mountains with here and there outbursts of cascades and streams will kiss goodbye to your worries in a jiffy. Transport options to these places are readily accessible from the main Mirzapur city. Both public buses and private cabs are available at reasonable rates. Mirzapur is a small town in Uttar Pradesh with just about 4521 sq.km. If you wish to experience the tales of a small town in India, you can do it just by exploring the lanes of Mirzapur. 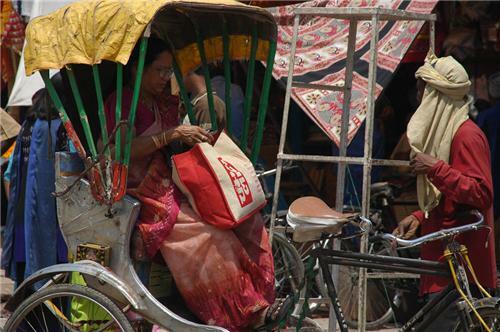 The best way to get around the city is by auto rickshaw. The fare is negotiable and you can have a look around the entire city at a comfortable, cheap price. Walking around the city is also a good way to explore. In many nook and crannies of Mirzapur, carpet weavers can be seen busy with their work of art - these gullies cannot be reached in auto rickshaws, and thus, walking through the lanes is the best option. Mirzapur railway station was established way back in 1864. It is located on Howrah-Allahabad-Mumbai line and Howrah-Delhi line. It is a small yet important junction with three platforms. Tourists visiting Vindhyachal, Chunar and regions of Mirzapur halt at Mirzapur junction. Trains traveling to important cities in north pass through this railway station. Uttar Pradesh State Transport and Regional Transport Office bus services are available from Mirzapur bus stand. From here buses travelling to various cities of Uttar Pradesh are obtainable. However, if you are travelling to outskirts of Mirzapur to places likes Sirsa Dam, Windham falls, Lekhania Dari, Tanda Falls, Meja Dam and others and happen to pass across Varanasi, Lucknow are other neighbouring areas – avail a direct private taxi from those popular tourists destinations. Transport and communication system in the city is disorganised and haphazard and there is no guarantee of the taxi services.